These are instructions for the SAMi-3 App. If you are looking for the instructions for the original SAMi App (for cameras with the QR code on front) click here. 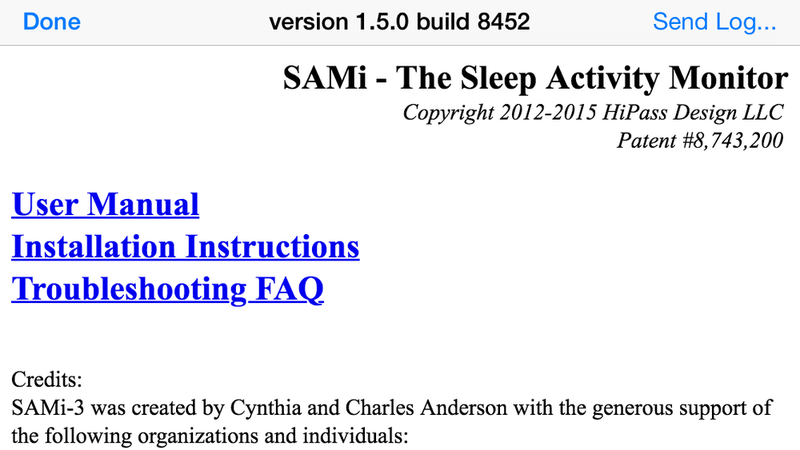 Installation instructions for SAMi-3 are here. This is the main monitoring screen. Across the top is the status bar showing your cell (mobile) provider and signal level and WiFi signal level, time, and battery level. Below that is your live video. You can zoom and position the video image by using pinch and drag gestures on the image area. You can also double tap to zoom in. In the upper left of the live image is the date and time overlay, this is in the format YYYY/MM/DD and should be very close to your iPhone time (it is set automatically). In the upper right of the the live video stream is the Monitor Status Indicator. If this is green and showing 3-4 bars then motion monitoring is active and working well. If this turns yellow, or is off, motion monitoring is disabled. Information on how to address this is on the troubleshooting page. To the right is the motion and alert meters and status indicator. The green bar on the right above the camera icon is the motion activity meter. The height of the green bar indicates the current amount of motion. The pointer on the bar indicates the motion threshold. Anytime the green motion meter is above the motion threshold the alert meter slowly rises. When the motion meter is below the motion threshold pointer, the alert meter drops, first slowly then more rapidly the longer the motion meter remains below its threshold. The pointer on the alert meter indicates the level necessary to trigger the alarm. If the alarm is enabled and the alert meter passes the alert threshold, the alarm will sound. The alert threshold is specified as the number of seconds of continuous motion with the motion meter above the motion threshold required to sound the alarm. Above the motion and alert meters is the alarm status indicator. If the alarm is enabled under settings you can touch the alarm status indicator at any time to immediately enable or mute the alarm. The alarm is disabled under settings. The motion and alert meters will still operate but no alarm will sound. To enable the alarm change the "Alarm Enable" switch in setup. The alarm is on and will sound if the alert meter exceeds the alert threshold. Touching will mute (disable) the alarm. The alarm is on and will sound if the alert meter exceeds the alert threshold. The alarm is scheduled (under setup) to be disabled at the indicated time. Touching will mute (disable) the alarm. The alarm is muted and will NOT sound. Touching will enable the alarm. The alarm is muted and will NOT sound. The alarm is scheduled (under setup) to be enabled at the indicated time. Touching will enable the alarm. After an alarm sounds, the alarm will be temporarily disabled. This is so it is not immediately re-triggered by ongoing motion. As soon at motion stops, the status will switch to the countdown display below. Motion has stopped and the alarm is still disabled. If motion remains stopped for the two minute countdown the alarm status will switch to being enabled and and green. If motion resumes during the countdown, the status will switch back to waiting for no motion and the countdown timer will be reset. When an alarm is triggered, it sounds continuously until you touch the Mute Alarm button. Touch the button to turn off the alarm and switch back to the Live Video Display. After the alarm is muted, if the mic is off it is turned on automatically for one minute. If the mic is already on it stays on. At the bottom of the Live Video Display are the menu buttons. These hide automatically after a few seconds of inactivity to prevent you from accidentally pressing them. To reveal the menu buttons, tap anywhere on the screen. Choosing clock from the menu switches the display to a simple clock. In the upper right is the Monitor Status Indicator. You can adjust the brightness by touching and dragging left and right. A single tap switches back to the Live Video Display. The Mic button turns on and off the sound from the camera microphone. The button is green when the microphone audio is turned on. The Lock button locks the SAMi app. While the SAMi app is locked, motion detection is still running. Locking the SAMi app prevents accidental changes to the app while you have the iPhone/iPod/iPad device in your pocket. While the app is locked the screen is dimmed to save power. If the alarm is triggered, your device will vibrate in addition to sounding the alarm. To exit lock mode, touch the screen to reveal the slider. Slide it to the right to unlock. Recordings are made in the SAMi camera and then transferred automatically to your iPhone/iPod/iPad. These recordings are organized in groups shown here. Recordings can appear in multiple groups, for example a recording that has been locked will appear in the All Recordings group and the Locked Recordings group. If you delete a recording, it will be removed from all groups except the Deleted Recordings group and the SAMi Camera SD card group. New Recordings contains any recordings that have transferred since you last after the last time the recordings menu was viewed. All Recordings contains all undeleted recordings. Recordings made in the last 24 hours contains recordings whose start date and time are within the last 24 hours. Alarm Recordings contains all recordings that are marked with the alarm tag. Recordings are automatically marked with the alarm tag if the alarm sounded near the recording time. You can also manually mark recording with the alarm tag. Locked Recordings contains all recordings that are marked with the lock tag. Locked recordings are never deleted. Alarm tagged recordings are automatically locked. You can also manually mark recording with the alarm tag. Recordings older than a week contains recordings older than a week that have not been deleted. Deleted Recordings contains all recordings that you have marked for deletion. Recordings included here can be recovered (un-deleted). Recordings on SAMi camera SD card contains all recordings still on the camera's microSD card. This includes recordings that have already been transferred. You can remove the microSD card (make sure the camera is off first) and transfer these recordings to your computer using the supplies SD card adaptor. If a recording has been deleted from your iPhone/iPod/iPad, it can be recovered from here. Each recording is appears as a separate entry, listed in order with the most recent recording at the top. Each entry includes the date, time, and duration of the recording. A recording that has been transferred to your iPhone/iPod/iPad has a thumbnail and can be played immediately. A recordings that is in process of being transferred shows a circular progress indicator. A recording that is on the Camera's microSD card shows the SAMi camera icon. Recordings marked with the alarm tag have the purple bell icon. Locked recordings show the black padlock. Below these icons is a horizontal progress bar showing how much of the recording has been viewed. Recording lengths range from 10 seconds to 300 seconds (5 minutes).5 minutes. If motion continues longer than 5 minutes, SAMi creates multiple, sequential recordings. To play a recording, touch it. If the recording is on the iPhone.iPod/iPad it will play immediately. If not, it will first transfer then play. Press the “Older” and “Newer” buttons to skip back and forward through the recordings. Press the “Recordings” label in the upper left when you want to return to the list of recordings. Touch the screen anywhere to show the playback transport controls. Important recordings should be locked to keep them from being automatically deleted to make space for new recordings. You can also touch the delete button to delete recordings you don't want to keep. They will be deleted once you exit back to the recordings list. If you change your mind before then touch the "Will Delete" button to undo. Note that deleting is entirely optional, unlocked recordings will eventually be deleted for you. You can also manually add and remove the alarm tag. To email a recording, touch the Email button. You will be prompted for the email address. Note that you must have an email account set up on your iPhone/iPod/iPad for this to work. Instructions on setting up an email account are here. If the recording is long, it may be split into parts. Once you are done playing the recordings, Touch "Recordings" in the upper left to return to the list of recordings. Your most recently played recording will be at the top have have the recording time in bold. To delete a single recording, swipe from right to left (or left to right) on the entry you wish to delete. Then touch the displayed "Delete" button. Remember, recordings are marked as deleted, but not actually deleted until space for new recordings is needed. If you do this in the deleted recording group, the recording will be removed from all groups except the Recordings on SAMi camera SD card group. Touching "Edit" in the upper right switches the recording list into edit mode. Touch recordings to individually select and deselect them. Or use the selection buttons in the lower left to select all or just unlocked. Once recordings are selected the operation buttons in the lower right become active. You can use these to tag or delete the selected recordings. Touch "Help" for links to the online manuals. If you experience a problem, you can help us help you by sending a log file. Press the “Send log…” button in the upper right to compose an email with an attached app log file. Please edit the email to include additional information that describes the issue. The log file only includes information about the operation of the app; no recordings of any kind are included. Setup is used to add, remove, and manage your SAMi camera, as well as customizing the behavior of the app. Press the Reset button in the upper right to restore all the settings to their defaults. This does not change your camera settings or affect your recordings. The Cameras section lists all your camera options. The cameras on your iPhone/iPod/iPad are always listed and you can use these cameras for trying out the app or for demonstration purposes. Note that the SAMi app only makes recordings from the SAMi network camera. It does not make recordings from the built in cameras . If you are installing a new camera, follow the instructions in the Quick Start Guide. If you are connecting an iPhone/iPod/iPad to a camera that was previously set up, you will be prompted for the passcode. When you have completed step 4 in the Quick Start Guide, select "Add SAMi-3 Network Camera". The SAMi app will search for the camera on your network. If the search takes longer than 30 seconds, press cancel and confirm your iPhone/iPod/iPad is connected to the correct network and that the camera is on and connected to your router with an Ethernet wire, and try again. Once connected you will see this message. The code that appears is the MAC address of the camera, this should match the label on the back of the camera. Choose "Skip WiFi Setup" only if you are going to use the camera with an Ethernet wire connected. If you choose "Setup WiFI" the app will then command the camera to search for the WiFi network your iPhone.iPod/iPad is connected to. Once found, it will prompt your for your WiFi network password. If your network is not configured with a password (not recommended) it will skip this step. The SAMi app will then set the password on the camera and test it. This step may take a little while, the camera is being configured and assigned a unique passcode for security reasons. Once complete your camera is ready for use. You will then see the camera listed under the device camera. The check mark indicates that the SAMi camera is selected, you can change cameras simply by touching them. Press the blue "i" to change to the Camera Settings screen. The camera settings are stored on the SAMi camera . If you have multiple iPhones/iPods/iPads connected to this camera, a change made by any of them will be reflected on all of them. This is unlike the non-camera settings (such as the alarm motion and alert thresholds) which can be set individually for each iPhone/iPod/iPad. Record Threshold allows you to control the amount of motion that is require to start and continue a recording. The lower the setting the less motion is required. Setting the value low will result in more and longer recordings. Setting the value higher will result in fewer and shorter recordings. If the movement you are interested in capturing is of a small range (like foot wagging, or finger tapping) then set this very low. If the movement you are interested in capturing is more dramatic (like the movement of arms and legs or side to side head motion) then set this mid to high range. Please be aware that setting this too high may result in you missing events including alarmed events. This is automatically assigned by the SAMi app as part of the "Add Camera" setup process. This passcode is required to connect another iPhone/iPod/iPad to your camera. This field shows the WiFi signal quality at the camera. It ranges from "Offline" to 100%. Higher is better, but there is no firm minimum value. Use this to evaluate the effect of changes you make (such as raising your WiFi router higher). This is not the iPhone/iPod/iPad signal level. If you are connected with an Ethernet wire this will display "WIRED". Select this to control the times the camera makes recordings. By default schedule one is set to record all day, every day. You may set up to 4 individual recording stop and start times and days of the week. The recordings will still only be made when there is motion, but recordings will not be made during the off times. This is commonly used to stop recordings being made during the day. The multiple schedules allow you to accommodate differences like weekend versus weekday schedules, or nap times. To start using the scheduling system touch the Schedule 1 line. This shows the default setting of every day, all day. To set specific start and stop times, touch the green “all day” button. This will display the spinners for setting the start recording and stop recording times. You may also touch the days of the week buttons to deselect or select the days the schedule applies to. Select the back button in the upper right to create the schedule. To disable a schedule, select the schedule, then touch “disable”, and then select the back button. Here we can see that the weekend days are deselected, so recording will start at 9PM (21:00) and will stop at 7am (07:00) on weekdays only. You can now select "Back" in the upper left to return to the list of schedules and select a new schedule to set. Here is schedule 2 set to accommodate a later bedtime and wake up time on weekends (still probably too early for teenagers). This is the modified schedule. Be careful, it is easy to make a mistake and possible miss recordings. Also, do not set up overlapping schedules that are both active. If you do the behavior is unpredictable. Press "Camera Settings" when you are done to return. Format Camera SD Card is used to completely erase all recordings from the camera. Use this with caution, as any recordings that have not been transferred to your iPhone/iPod/iPad will be erased and cannot be recovered easily. This process is used when there is a possibility of corrupted files on the SD card. The symptom of this is extremely slow transfer or no transfer of recordings. Please contact customer support if you have questions about the use of this feature. Note that this is a "quick format". It may be possible to recover recordings even after a format using forensic software tools. Set up WiFi is used to setup your WiFi connection if you are changing from using a wired connection, or if you are changing WiFi networks or passwords. Your camera should be connected with an Ethernet wire before choosing this. This will return all settings on the camera to the factory defaults and format the SD card. Use this if instructed by customer support or if you are transferring ownership. After running this your camera will be removed from the SAMi app. In order to use the camera you will need to perform the "Add Camera" steps again. This allows you to remove the connection between the current camera, router, and iOS device in order to set up and connect to a different camera. Enable Alarm – The normal setting is ON. OFF prevents the alarm from ever sounding. When the alarm is set to OFF, the motion and alarm meters will still show activity, but recordings will not be marked when the alarm meter passes the threshold. Motion Threshold – Sets the motion threshold. A lower setting is more sensitive to motion; a higher setting is less sensitive. A typical setting is in the range of 10-25%. Alarm Threshold – Sets the alert threshold. The setting is calibrated in time. For example, a setting of 20s means that the alarm will sound when the motion meter stays above its threshold for 20 seconds. A lower threshold number causes the alarm to sound faster but it might cause more false alarms. A higher threshold number might have less false alarms but also might miss shorter or less continuous events. Border Size – Sets the size of the motion border region. The border defines the area that is the central monitored area for the camera; everything outside the border is the border region. Motion that occurs in the border region does not trigger the alarm but it still triggers recordings. A higher setting increases the size of the border region, which decreases the size of the central monitored area. SPECIAL NOTE: The border area is not currently displayed, which can make it difficult to appropriately set and manage this feature. A future release is planned to include the border area display. Smart Edge - This is a specialized use of the border region. If motion occurs in the border area the alarm system behaves as if the alarm has been triggered. This will set the alarm state to "Off waiting for no motion". It will stay in this state until there is no motion anywhere. Then it will rearm. The intent is to automatically suppress the alarm if a caregiver comes into the camera's field of view. Caution, when you use this feature you lose the feature of ignoring motion in the border region. This is experimental. Alert on Camera Fault – This setting causes a periodic beep alert to sound if SAMi is not sensing motion. The normal setting is ON. Alert on Low Battery – This setting causes a periodic beep alert to sound if the iPhone/iPad/iPod battery is below 20%. The normal setting is ON. You can use this section to configure the alarm to automatically turn on and off on a schedule. When the schedule is enabled, the alarm turns off at the Alarm Off time and turns on at the Alarm On time. This is independant of the recording schedule. Note that you can still manually turn the alarm on and off at any time by touching the alarm status indicator on the Live Video Screen. Use these volume bars to specify the microphone and alarm volumes. Mic Volume sets the level of microphone sensitivity; the higher the level, the more sounds the microphone picks up. The microphone is automatically turned on for one minute when you press the Mute Alarm button after an alarm sounds. Alarm Volume sets how loud the alarm sounds. WARNING: If you set the alarm level too low, you may not hear it when it sounds. SPECIAL USE CASE: By setting this to zero you may have all alarm features operational, including the marking of recordings, but there will be no alarm sound and the live video screen will not show the mute alarm button. Screen Timeout to Clock – When this setting is set to ON, the display automatically switches to the Clock Screen after the specified Timeout Delay. Timeout Delay – This setting is calibrated in time. 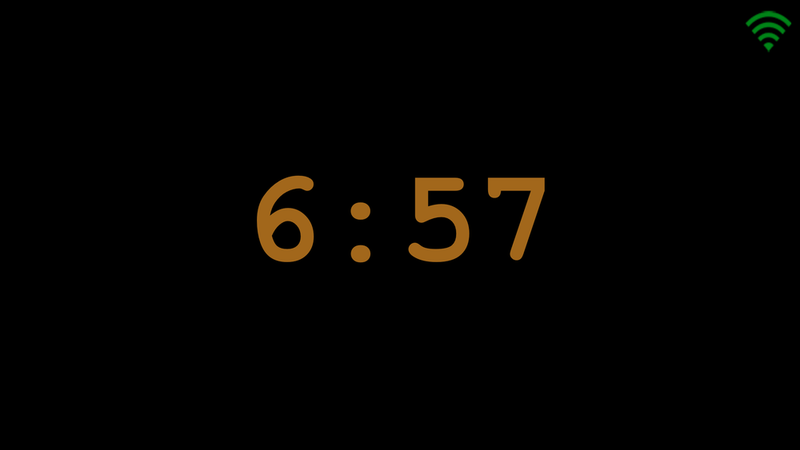 For example, a setting of 60s means that the display switches to the Clock Screen after 60 seconds. If turned off recordings will not be transferred to your iPhone/iPod/iPad. This setting does not suppress recordings being made, only the transfer. Recordings will still exist on the SD card. This feature is useful if more than one iPhone/iPad/iPod is used to run the SAMi app but you would like to only have all of the recordings on one particular device. This setting allows you to limit the amount of storage used for SAMi recordings. When the limit is reached the app will delete recordings starting with the oldest recordings in the deleted folder. If there no more recordings marked as deleted and space is still needed, unlocked recordings will be deleted starting with the oldest.